For some reasons, Wi-Fi modules are pretty popular this year. 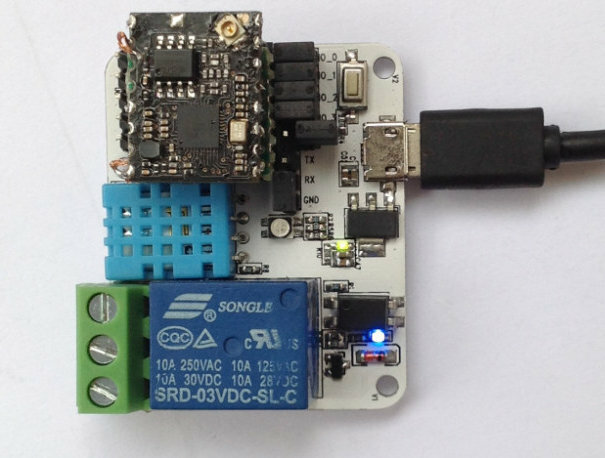 After modules such as VoCore, AsiaRF AWM002, and ESP8622, here’s come xWifi. This module is based on Mediatek MT7681 SoC which includes a TCP/IP stack like Espressif ESP8622 or TI CC3300, so it won’t run OpenWRT like VoCore or AsiaRF modules. The module only consumes about 350mW during transfer, it will be open source hardware, and the xWifi module plus a dock with a 10A relay, a humidity and temperature sensor, and a LED will go for as low as $17. The module can be used for smart home appliances, smart plug and door locks, smart lighting, metering, remote control, network consumer devices, and more. Relay – Songle SRD03VDC-SL-C – 3V for control pins. 230V/10A support. The kit comprised of the xWiFi module and the dock with be open source hardware with schematics, PCB layout, Gerber files, and BoM released. An SDK with samples apps for Android & iOS will also be provided. If you want to know a bit more about MT7681, you can download the datasheet, but you may also access much more resources with documentation, code samples, and SDK via a forum post on Andes Workshop. The datasheet also gives some pricing information for another MT7681 module by Shenzhen Anxinke Technology, which sells for 30 CNY (~$5) in 500-unit order, and as low as 25 CNY (~$4) for 10k orders. xThink Lab, the company behind the project, has now completed development, and they are looking for $4,500 or more via an Indiegogo campaign to start mass production in November. There’s no word about FCC/CE compliance by the way…, but it was the same with VoCore at the beginning and it ended up being ultra successful. An early pledge of $17 will get your a full kit with xWifi module and the dock. There’s no way to get a xWiFi module only, unless you pledge $37 for 3 modules. Shipping is free to the US and China, and $3 to the rest of the world, with delivery scheduled for November 2014. You need an NDA to get the MT7681 SDK. How is an Indigogo project going to work when you can’t get the compiler? I don’t like basing projects off from illegal downloads. pls refer to the link below about the compiler? it’s so easy to set up the compiling environment . The document you linked has a great big “Mediatek Confidential” across every page. But these are just the compiler for the chip. I’m sure that Ralink’s wifi libraries will still be covered by NDA. Mediatek encourage and welcome the minority of users ,then going strong. Mediatek is a great corporation .For the minority of our users ,they continue to be open and inclusive ,please do not worry too much about NDA ,unless working on a deeper integration with them in future. I am just reading a post of yours from late 2014 re xThinkLab.com baseboard with MT7681 wifi module. I also purchased from Indiegogo and just today power up for the first time. I cannot understand how to get the ssid and password into the device. The website is now down… It does not look good. I’m not sure how to configure it. But this type of board normally ship with AP mode running with an open SSID. Any suitable hardware & software device to load Kodi & view. Any design or product support is appreciated.